A friend at work put me onto ladyada’s blog recently. I’m a fan of her work: I built her MiniPOV kit a while back and really enjoyed it, and I’d recently picked up a couple of Arduino shield kits from her (that I haven’t had time to build yet), so I was interested to keep up on her projects. On her blog I came across the Drawdio, a kit originally designed by J Silver (http://drawdio.com). 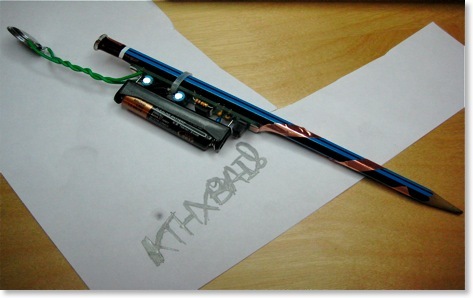 It uses a standard pencil and generates fun sounds using the conductivity of the carbon in the ‘lead’. I had been looking for a quick and cheap project to tryout my new soldering iron anyway, and this seemed to fit the bill; plus, the kids would like it, right? It only has a few through-hole parts so it doesn’t take very long to assemble the kit at all, even for someone as inept at soldering as I am (loving that Weller WESD51 by the way: beats the pants off my old chisel-style iron). The end result is pretty fun to play with, the only negative being that it could stand to be a bit louder. I’m not sure if I’m up to it, electronics-skillz-wise, but maybe I can hack in an amp someday?